"Bohemian" was the label attached to artists, writers, students, and intellectuals in early nineteenth-century France after the turbulent years of the Revolution. The reason for the name was that these artists were likened to wandering gypsies, and it was believed (incorrectly) that gypsies came from Bohemia in central Europe. With rapid economic and social change, the artist's status became financially insecure as the market replaced the old system of patronage. At the same time the Romantic Movement introduced the seductive notion of the "Artist as Genius." An artist was no longer someone with a particular talent, but became a special kind of person. In earlier times dress had signified social status, a trade, membership of a princely retinue, or a profession. Now for the first time, dress became part of the performance of an individual personality, as the young bohemians used costume to signify their poverty and originality. There was no single chronological line of development in bohemian dress; rather, there were several different strategies. In the 1830s the styles of dress favored by French bohemians had echoes of the Romantics' love of the medieval and of orientalism. Influenced by the fevered poetry of Byron, they favored rich materials and colors, wide-brimmed hats, and long flowing curls. A second style, described by the novelist Henri Murger (1822-1861), whose bohemian tales are best-known today as the basis for Giacomo Puccini's opera, La Bohème, was simply the uniform of abject poverty, threadbare coats and trousers, leaking shoes, and general dishevelment. 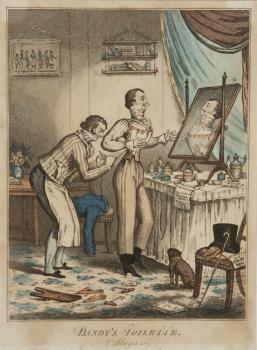 A third influential style was the restrained black and white of the male dandy. Dandyism originated in Regency England and, although distinct from bohemian dress, was influential in that dandies, such as George Bryan "Beau" Brummell (1778-1840), developed a cult of the self. They went to such lengths that their appearances became almost works of art in their own right, blurring the dividing line between life and art. This was significant for the bohemian way of life, since for many bohemians this line was blurred in any case, and style, surroundings and dress became as stylized and carefully wrought as more conventional artwork. Then there were those who were influenced by the nineteenth-century movements for dress reform. Dress reformers advocated an end to the distortions and restrictions of fashion, especially women's fashions, and searched for a permanently beautiful form of clothing that would put an end to the fashion cycle. The English Pre-Raphaelites were the best known such group. One of their members, William Morris (1834-1896), who built a successful business on the design and sale of alternative textiles, wallpapers, and embroidery, designed robes for his wife, Jane, that were far removed from the crinolines and corsets of the mid-Victorian period. These innovators were part of the Arts and Crafts movement that spread throughout Europe during the second half of the nineteenth century and by the 1890s had reached Germany, where the styles were combined with art nouveau motifs. The painter Vasily Kandinsky (1866-1944), for example, designed dresses for his lover, the artist Gabriele Munter (1877-1962), which had the natural Pre-Raphaelite line, with full sleeves and loose waists for ease of movement. Kandinsky and Munter belonged to the artistic and bohemian culture that flourished in and around Munich during this time, where bohemianism was taken to extremes seldom seen before or since. Some of these eccentrics and revolutionaries expressed themselves by adopting what amounted to fancy dress, in imitation of ancient Greece and Rome, or sometimes borrowing from peasant culture. Bohemian dress, like the whole bohemian counter-culture, underwent many vicissitudes during the course of the twentieth century. 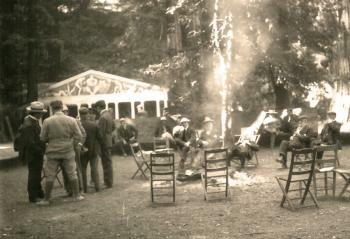 Between World War I and II, bohemianism became for many young people little more than a phase during which they would dress in a picturesquely rebellious manner, live in artists' studios, and go to bohemian parties-a way of life not so different from that of students in the twenty-first century. The link between genuine creativity and a style of life became attenuated. The idea of "lifestyle" was developing, even if the word did not come into use until after World War II. Yet the idea of bohemia as a privileged and special place-or even just an idea-remained as a kind of umbrella concept beneath which society's dissidents, geniuses, misfits, and eccentrics still gathered to encourage and support one another. For example, lesbians in the 1930s often regarded themselves as bohemians rather than as belonging to a distinct "lesbian subculture." After 1945 this changed. Bohemia had always effectively been a land of youth, but it was only with the development of the mass media and popular music that the existence and costuming of the generational divide became explicit. Jazz, swing, and rock and roll came with their own uniforms of rebellion. 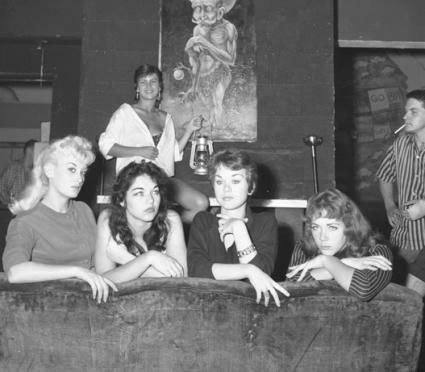 Then came beatniks with, for young women, white lips, black kohl-ringed eyes, peasant skirts, black stockings, and "arty" jewelry- but now for the first time such styles were quickly broadcast via the mass media to a much wider circle of bohemian wanna-bes. The 1957 Audrey Hepburn film, Funny Face, for example, satirized Greenwich Village style-at the beginning of the film the star is shown working in a bookshop, dressed in a tweed jumper, black turtleneck sweater, horn-rimmed-glasses, and flat ballerina shoes. Artists and writers that were displaced as minority groups took center stage in the creation of countercultural dress. 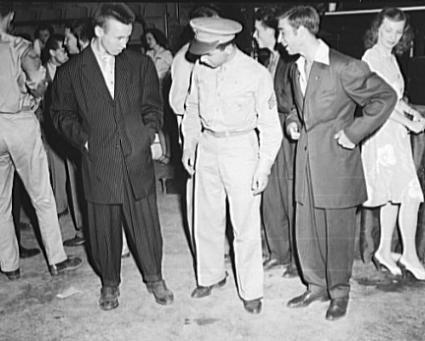 Alongside the huge influence of black American style, beginning with the zoot suit of the 1940s, the emergent lesbian and gay culture began to make an impact. Although the most familiar form of alternative dress in the 1960s and 1970s was the hippie style, which boasted bricolage, secondhand clothes, and ethnic items to create a statement about an alternative lifestyle opposed to the consumer society. Yet at the dawn of the third millennium, it hardly seems as if rebellion can any longer be expressed in the wearing of outrageous garments. Bohemian dress was always a provocation, but in Western, or westernized urban settings, at least, there hardly exists a style of dress that can shock anymore. Grunge, and the styles of Nirvana in the early 1990s, was the last form of dress that aimed to express dissent of the traditional kind. But, like every style, it was no sooner seen on stage than it appeared in every mass-market fashion store in the Western world. Some have suggested that rebellion of the old bohemian sort is no longer possible, since there no longer exists a single mainstream or dominant form of society against which to rebel. Instead we have what one French sociologist terms "neo-tribes,"-groups with fluid membership of young people who are no longer confrontational, but have an allegiance to certain styles of music, dress, and clubbing. There are exceptions: Goth style and the accoutrements of the anti-globalization movement single out participants fairly definitively. Yet what was once the casual originality of bohemian dress has become the height of celebrity fashion and of high-street style. It therefore follows that in the twenty-first century, when everyone is bohemian, no one can any longer be. See also George (beau) Brummell; Subcultures. Beard, Rick, and Leslie Cohen Berlowitz, eds. Greenwich Village: Culture and Counter Culture. Camden, N.J.: Rutgers University Press, 1993. David, Hugh. The Fitzrovians: A Portrait of Bohemian Society, 1900-1955. London: Michael Joseph, 1988. Siegel, Jerrold. Bohemian Paris: Culture, Politics and the Boundaries of Bourgeois Life, 1830-1890. New York: Viking Press, 1986. Wilson, Elizabeth. Bohemians: The Glamorous Outcasts. Camden, N.J.: Rutgers University Press, 2001.